I came up with this based on a recipe that my Mom makes, Italian Wedding Torte. 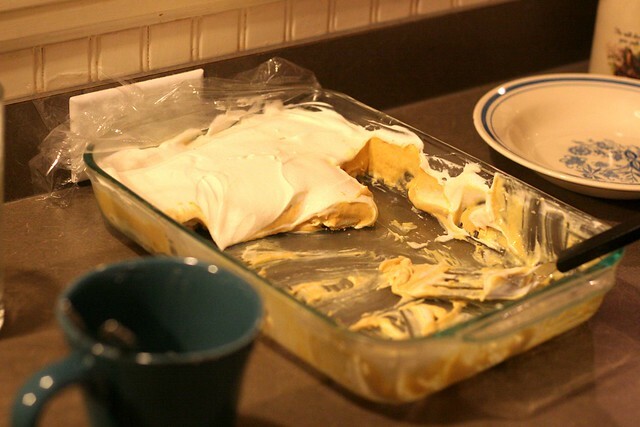 It is a layered dish: crust, cream cheese layer, chocolate pudding, vanilla pudding, and cool whip. I thought about whipping up a big bowl of pumpkin pudding and using that instead. It was a great success. Really. See below. The crust is buttery, and the layer of cream cheese adds a rich texture to this torte. The light pumpkin flavor is perfect for the season. It's also EASY to make and pretty low calorie... except of course for the crust. I used light versions of all the ingredients and sugar free pudding. You could use full fat versions though! The crust is just butter and flour. That's it. Can you believe it? Mix together 1 1/2 cups flour with 1 stick of partially melted butter. I used my hands because it's really crumbly. Once it's combined, press it into the bottom of a 13x9 pan. No need to grease it, obviously. Bake it in a 350 degree oven for 20 or 25 minutes, until it's golden brown and your whole kitchen smells like buttery goodness. It will be cracked and crumbly... but that's what you want. No need to add sugar to the crust because the rest of the layers are sweet. This easy crust makes the perfect base. 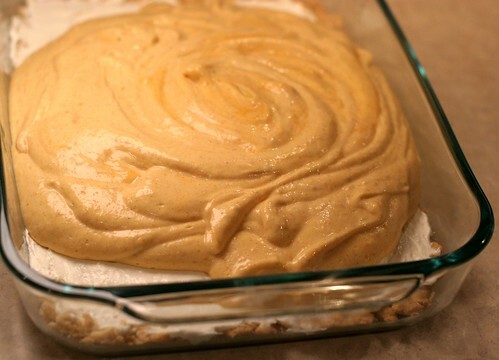 While the crust is cooling, it's time to make pumpkin pudding! Remember when I said this was easy? Homemade pudding is not necessary here. Makes life easy. Add 3/4 cup of canned pumpkin to the pudding. Then some pumpkin pie spice (ground ginger, cinnamon and nutmeg) and cool whip. Mix it together until it's all combined and you have a beautiful, light orange pudding. Grab a small bowl. Whip cream cheese, cool whip, and 1 tablespoon of sugar with a hand mixer until it's fluffy. Remove the beaters from the mixer and lick. Smile. Move on. Once the crust is completely cooled, it's time to make the layers. Fair warning: it is not easy to spread this thick cream cheese mixture on the crust. I find the easiest way is to dot the mixture around the crust, then use a small metal spatula to smooth it out... carefully. It is possible! It should look like this. If it doesn't, that's okay too. I can imagine that a cream cheese/buttery crust swirled concoction would be equally delicious. The next layer is yummy pumpkin pudding. Much easier to spread. 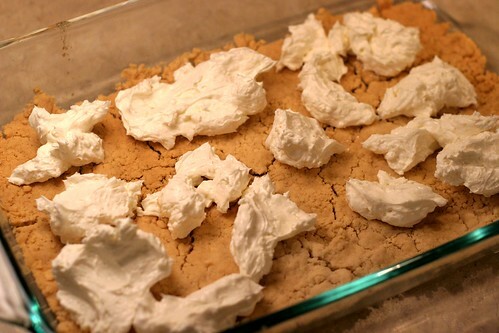 After that is cool whip mixed with 1 teaspoon of vanilla extract. I took this to Bible study the next night after I made it. So it had 24 hours to marinate and become insanely good. I was happy to share the pumpkin deliciousness with my friends. They are amazing people. I love Wednesday nights because I get to learn more about God and how He loves us. 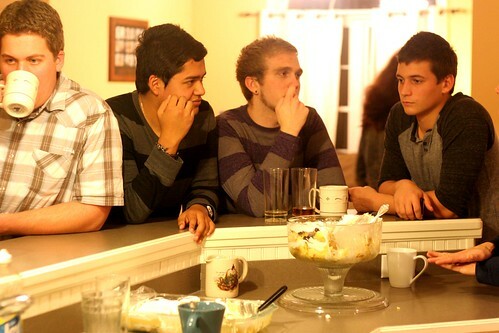 I also get to hang out with the coolest people ever. 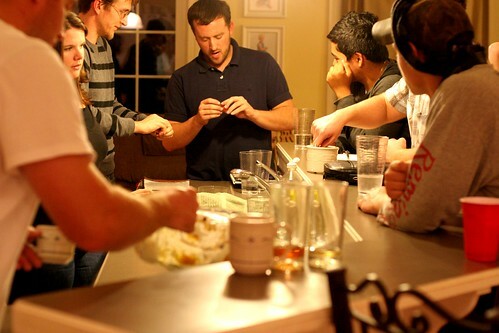 We all meet at our pastor's house, Matt. 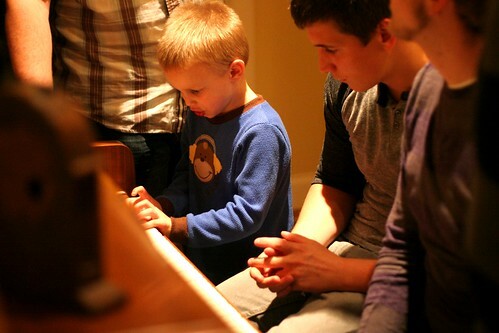 Him and his wife Jill have produced the cutest children I've ever seen (of course Summer too, Sarah. 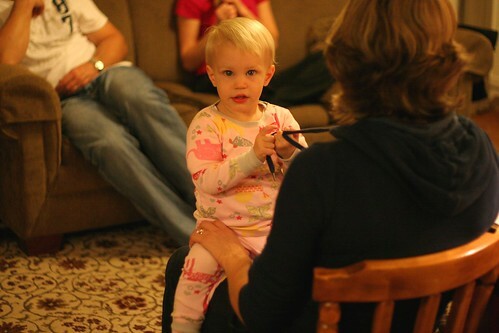 She is my favorite.). All of us are totally obsessed with how cute they are (Matt Sharp, you know). I hope Alia never grows any bigger or learns any new words. I want her to stay just like that. 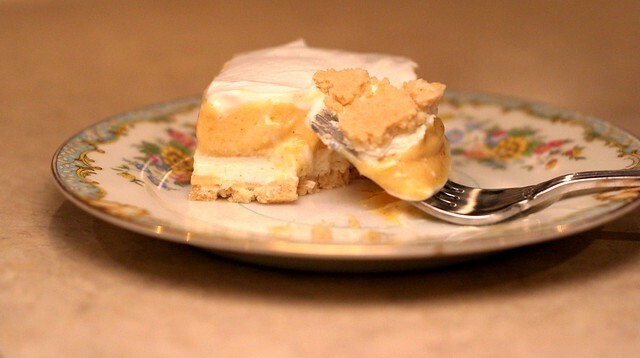 I hope you make this pumpkin pudding torte to share with your friends too. 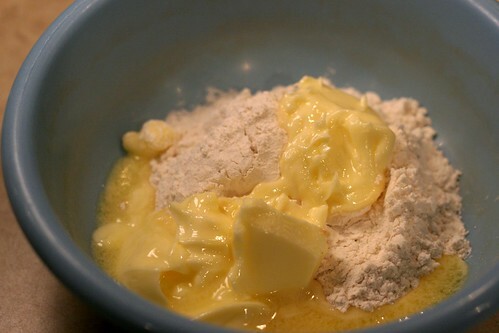 Mix together flour and butter in a small bowl with your hands until crumbly. Press into the bottom of a 13x9 pan, preferably glass. Bake at 350 degrees for 20-25 minutes or until golden brown. Put to the side to cool. 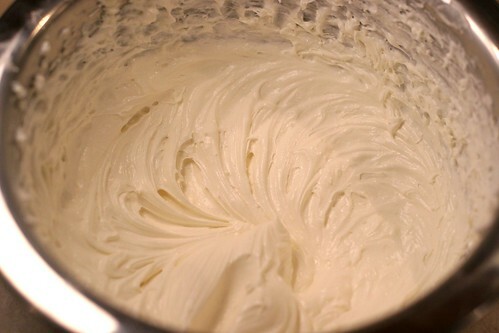 To make the cream cheese layer: use a hand mixer to cream softened cream cheese and 1/3 of the container of cool whip. Sweeten it with 1 tablespoon of sugar. Whip until fluffy and set aside. 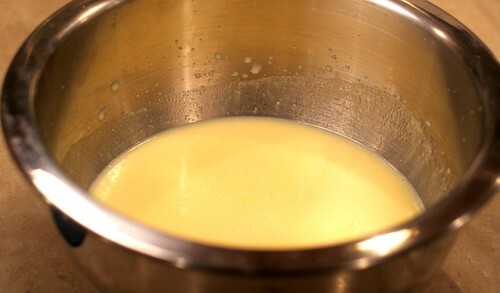 To make the pudding: whisk together the pudding mix and milk for 2-3 minutes. Add pumpkin, ginger, cinnamon and nutmeg. Stir. Add 1/3 container of cool whip and combine. Put in the refrigerator until you're ready to assemble the torte. 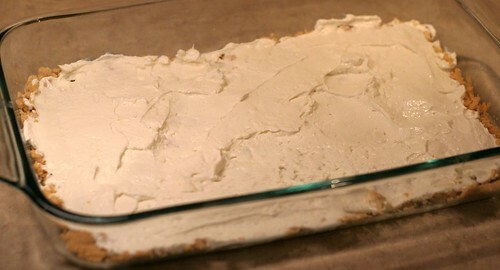 Once the crust is completely cooled, dot the cream cheese mixture around the crust. 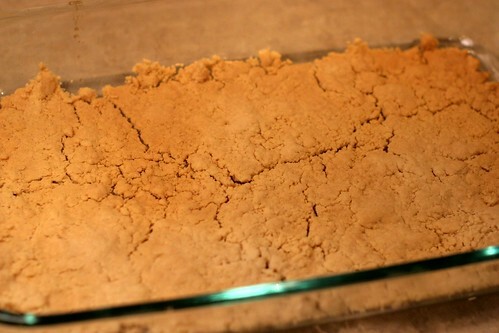 Use a small metal spatula to carefully spread the mixture around the crust. Keep working with it until it's all spread. Then pour pumpkin pudding over the cream cheese layer. Smooth. Top the torte off with the remaining 1/3 of cool whip mixed with vanilla. 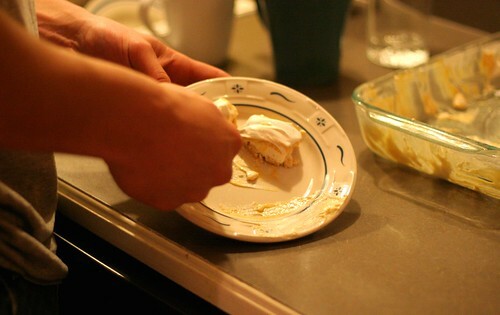 Spread until smooth and cool whip covers the whole torte. Wrap it in plastic wrap and refrigerate for at least 1 hour, or overnight. I am so sad that I missed this deliciousness and bible study last night. I missed you all <3 I am really looking forward to my birthday cake :) You have the recipe ready.. Right? Matt, Alia and Summer are tied for the 3 CUTEST kids ever. This looks delicious! And the best part is that it serves a crowd! 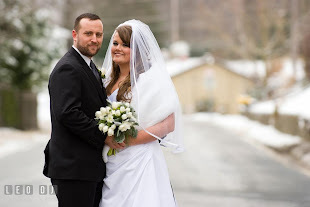 Enjoyed ur blog!